This variant rule is intended for a less realistic, more video game-like romp where the heroes of the story never need to rest, and begin most encounters with full hit points. Most critically, this rule assumes player-characters gain no benefit from a short rest. It also allows players to more strategically allocate the benefits of rest to those who need it. A recovery heart appears as a bright red heart-shaped object with a size and consistency comparable to a plum or peach. Once a heart is formed, it will almost always vanish in about 12 seconds (or 2 rounds). After 6 seconds (1 round), it will begin to flicker rapidly, as if fading in and out of existence, before finally vanishing from existence entirely at 12 seconds. If a living creature touches a recovery heart, either with its body or an object directly connected to its body, the heart vanishes abruptly, and the creature is invigorated with healing energy. Roll one of the creature's Hit Dice, add its Constitution modifier to the roll, and restore hit points equal to the result. If a character who restores spell slots, stamina points, or other numerical resources that are restored during a short rest, 0.5 ¼ of these resources are restored upon gaining a recovery heart. Gaining four hearts should be the equivalent of completing a short rest and expending four Hit Dice. Without the benefit of a magic item or a powerful spell, it is generally impossible to preserve a recovery heart after it has appeared. Recovery hearts are formed shortly after a hostile creature is felled. Whenever a creature is killed, roll a d20. Add that creature's CR to the result, but treat any CR below 1 as 0. On a result of 15 or higher, one recovery heart pops out of the creature's corpse. On 20 or higher, two hearts appear instead. On 25 or higher, three hearts appear instead. On a roll of natural 1, no hearts appear regardless of the CR; and on a natural 20, three hearts always appear. To prevent abuse of this rule, it is suggested the DM judge that any "farming" of recovery hearts fails. "Farming" strategies might include bringing along small but ferocious animals to kill in the middle of a dungeon to form recovery hearts, or other actions taken to expend relatively cheap resources to facilitate the appearance of hearts. 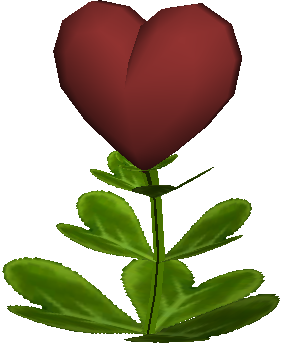 At the DM's discretion, there may be stationary plants or inanimate objects which when destroyed can produce recovery hearts. An abundance of these "free" recovery hearts can help facilitate a long and grueling dungeon, or an otherwise brutally difficult boss fight. This rule normally assumes all living creatures can see and benefit from recovery hearts. It allows, for example, a conniving hobgoblin to kill its already injured goblin underling in an attempt to heal itself with the heart that forms. Instead, for an extra layer of unreality, the DM may use this variant. With it, recovery hearts would be invisible and unusable to all creatures other than the player-characters.